As I'm expecting twins, I have had more frequent antenatal appointments and scans than I experienced in my previous two singleton pregnancies. As I'm doing 'shared care', for most of my appointments I've been seeing a great Obstetrician/Gynaecologist outside of the hospital and only have to attend the hospital's antenatal clinics every so often (which is good because, although being given an 'appointment time' of 8am, 9am, 10am or 11am, you're one of anything from 10-30 women in the waiting room and are not usually seen for around two hours - in my experience). 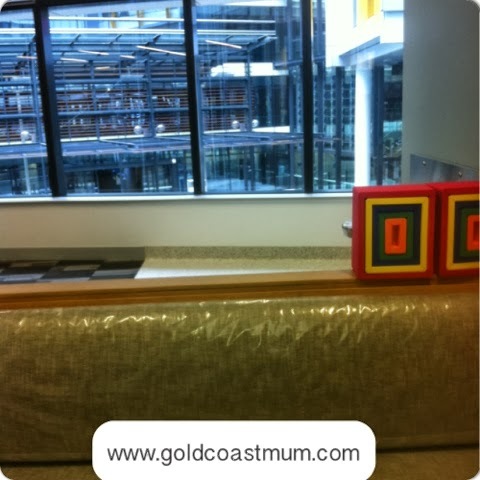 This week, husband, Mr 20 months and I were lucky enough to check out the new Gold Coast University Hospital for our first appointment since it opened last weekend. 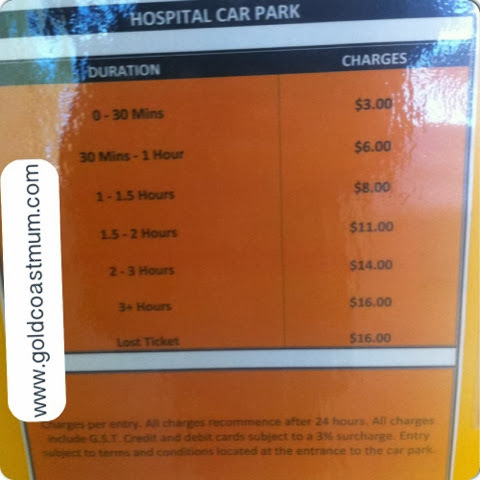 After hunting for a car park in the fancy new parking station for what seemed like forever (just kept going around and around and up and up and up til we finally came across the empty spaces), we were pleased to find out that the level we parked on gave us direct access to the hospital level and section we were after via an overpass that crosses over the road outside the hospital and delivers you directly in the centre of the hospital building. After locating the antenatal clinic, in the women's outpatient section in B wing, we stood in line for a while to hand in the pregnancy record form and then took a seat to wait our turn. 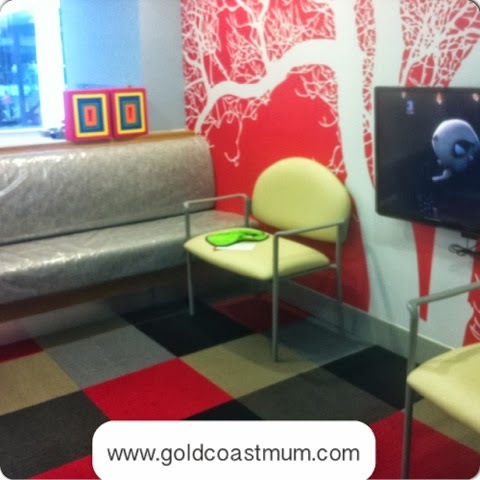 Thankfully, at the old Gold Coast Hospital, an enclosed children's area adjoined the antenatal clinic waiting area (and, I believe, some paediatric appointments). So it was perfect for anyone who already has little ones, to be able to keep them amused in a contained environment with the variety of toys and books – because, in our experience, it's usually a two-hour wait to be seen. The children's area attached to the antenatal clinic in the new hospital is pretty bare. There's a TV and two cube toys (which thankfully kept Mr 20 months amused for five minutes). Unfortunately there's no gate, so there were plenty of heavily pregnant women chasing around toddlers who wanted to roam free, or trying to keep them contained to this little area. Obviously having only just moved locations, I can understand why the children's area is yet to be fitted out with the toys from the last play area (I wonder whether that is even the plan?). After around an hour waiting around, hubby went on an adventure to hunt down a gestational diabetes-friendly meal for me. 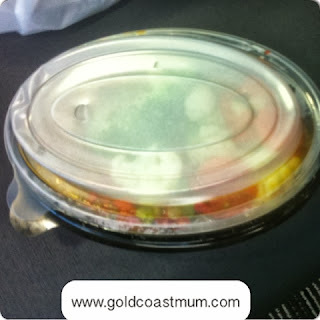 He scored big time (I actually don't mind hospital food/aeroplane food and containers etc – weird I know). He brought back a container of vegetables with a side of beef and chickpeas for me. Perfect. And lunch and a drink for himself. 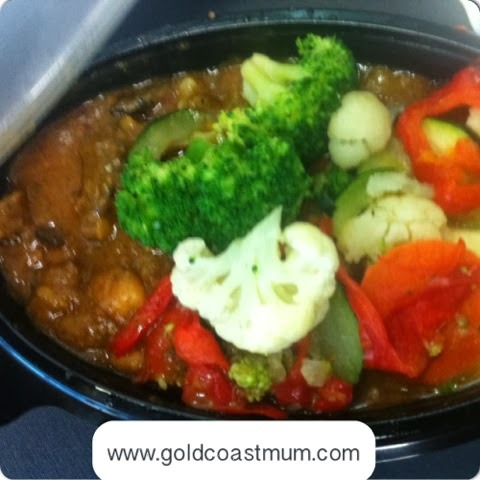 Although, for that price – total around $30, we could have enjoyed a nice pub lunch together instead of quickly scoffing half of the meal while in the waiting area, in case we were suddenly called in to our appointment (we weren't so I saved the rest to finish that evening at work). Finally we were called in to our appointment with the hospital Ob/Gyn. The staff are fabulous and appeared to be settling in well to their new base. After the appointment, we then had to line up again at the clinic reception to hand in forms to book the next appointment and to get directions to the ultrasound/imaging department, where we had to make our way to to go and hand in another form. After navigating our way through the hospital's spacious hallways and admiring the interior design and architecture, and taking two separate lifts to try and reach the imaging/ultrasound area, we made it to our destination. That's the thing about the new hospital, the parts we saw showcase that it's verrrrry spacious. Which is good and bad. Not so fun when you're 33 weeks pregnant with twins, have major pelvic pain and a waddle happening and have to walk all over the place just to hand in a form. Anyhoo, after handing in the form, we made our way back up to the car park (took another two lifts and the walk back over the overpass to the parking station) where we were greeted with the sign indicating the parking fees and the fact we had TEN minutes from the moment the ticket was paid for to leave the parking station. It was hard enough to locate the car, let alone load in a toddler, the pram, get toddler their water bottle and help giant pregnant lady squeeze into the passenger side (because the car next to us had parked too close for our passenger door to open enough for me to fit my massive bump – ha ha, yes I could have just waited til hubby had reversed our car for me to get in...). Anyway, after paying the $14 (PLUS credit card fee) for 2.5 hours of parking, we safely managed to exit the parking station (within the 10 minute time restriction) and hubby managed to drop me back at work. 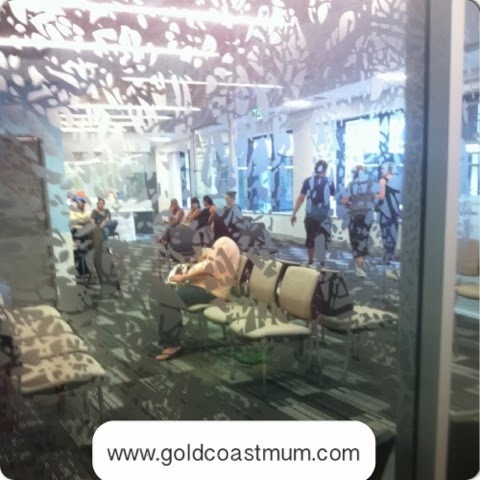 Our initial thoughts of the new Gold Coast University Hospital, from the limited areas we've seen, are that it's nice, attractive and very spacious. I'm excited to be having our twins at the new hospital and can't wait to see the birthing unit (in hopefully around 4-5 weeks). I feel fortunate to have such facilities available (if only the waiting times could be improved). But next time, we might need to be dropped off and bring a packed lunch to save us $44 for the 2.5 hour experience. Oh, I look forward to hearing about that - hope all is well. Yes the understaffing issue is a bit of a pain (for them and us). November is here! It's nearly time!